oohhh... where's that?! Looks divine! Fritto Misto at Via Napoli... calamari, arancini, cheese, and assorted veggies, lightly battered and fried to perfection. Served with a spicy tomato sauce. Delish. Calamari? Via Napoli? Now I must go there next trip....... yummo! It's a great way to start a meal at Via Napoli! We always like to play 'identify' the veggie on this plate. Some can be difficult. We had pizzas at Via Napoli and loved them. This looks really good. I will definitely try it next time! 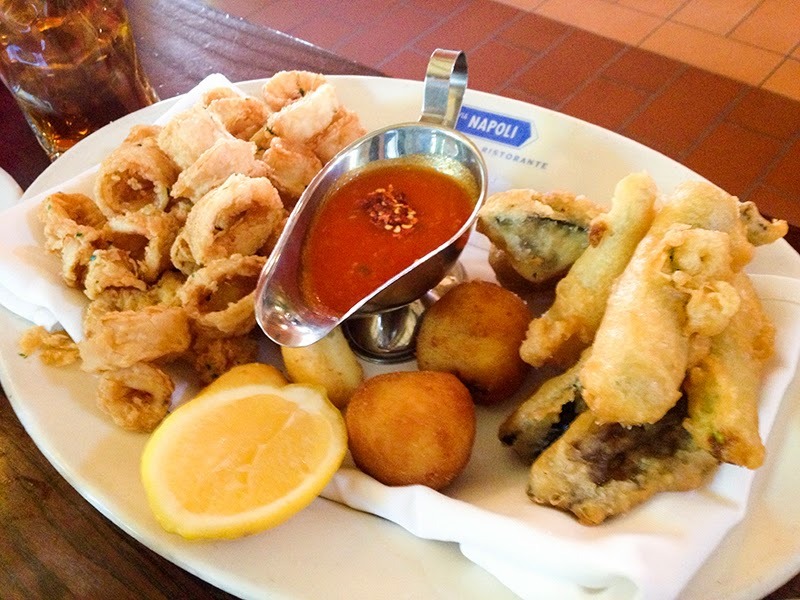 This looks great - yummy sampler :) I want to try that Calamari. I love how light and airy this dish is! The Via Napoli batter and frying technique is right on!! I wasn't quite sure what your photo was of Kelli, but it still looks yummy! I have since read the description and might have to pass on a few items, ie calamari, but the rest I am game for, LOL! My family loves calamari. This plate looks delicious! I haven't been to Via Napoli before. Looks yummy. As soon as I saw the pic, I said, "ooh, we've had that!!... twice!!" We love Via Napoli!! It's such a family friendly place that also satisfies the "foodie" in us!